Jamie Munguia has embraced the speedy trajectory of his past eight months since becoming WBO 154-pound champion, from being dismissed by division counterparts to being thrust into the limelight and touted as a 160-pound opponent for either three-division champion Canelo Alvarez or former titleholder Gennady Golovkin, he told BoxingScene.com on Wednesday. The 22-year-old Mungia (31-0, 26 KOs), of Mexico, makes his third defense in pursuit of his second straight knockout against 29-year-old Takeshi Inoue (13-0-1, 7 KOs), of Tokyo, Japan, in a January 26 DAZN main event at The Toyota Center in Houston, Texas. 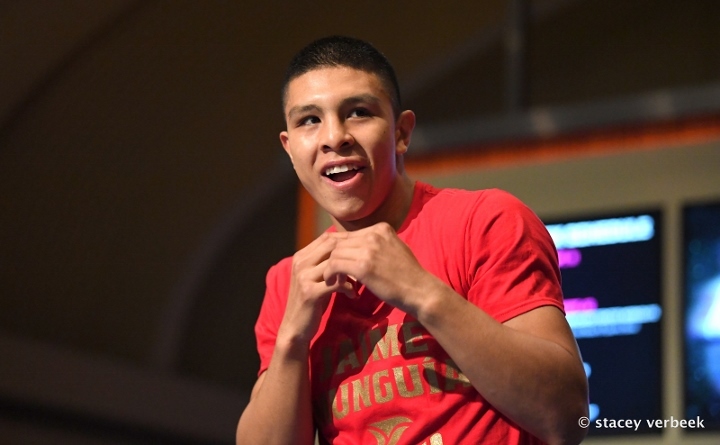 The bout is Munguia’s first after signing last month with Golden Boy’s Oscar De La Hoya in a co-promotional agreement between his company and Zanfer Promotions, which has worked Mungia throughout his five-year pro career. Munguia’s Golden Boy/DAZN deal maintains a trek toward landing a shot at Alvarez (51-1-2, 35 KOs), who knocked out England’s WBA “regular” 168-pound champion Rocky Fielding (27-2, 15 KOs) in the third round last month to become a three-division title winner. A native of Tijuana, Munguia would have to move up to 160 to secure that high-profile opportunity against Alvarez, who dethroned Golovkin (38-1-1, 34 KOs) as WBA/WBC middleweight champion by majority decision in September’s rematch of their draw in September 2017. “There’s no pressure on me because I’m conscious of what I’m doing. I think I can eventually move up to 160 and fight [Alvarez or Golovkin.] It’s a risk, but there will always be risks. Those two are two of the best fighters in the world. That’s our destiny, but that’s why we have to be focused on this next fight,” said Munguia, who was 5-0 with four knockouts in 2018 after being 7-0 with six KOs in 2017. Munguia has scored a combined six knockdowns in his past three fights, in succession dethroning Sadam “World Kid” Ali by fourth-round, four knockdown TKO (May 2018), and having twice defended it by one-knockdown unanimous decision over Liam Smith (July) and one knockdown third-round TKO of Brandon Cook (September). Ali (27-2, 14 KOs) was making the initial defense of a crown he earned in his 154-pound debut by dethroning and retiring Puerto Rican four-division and WBO champion Miguel Cotto (July 2017) by unanimous decision. Smith (26-2-1, 14 KOs) had won three straight since being dethroned as WBO titleholder by ninth-round stoppage against Alvarez (September 2017), and Cook (20-2, 13 KOs) had been previously stopped by unbeaten Kanat Islam (September 2017) via ninth-round TKO. Munguia also addressed the remote possibilities of unifications against counterparts such as IBF/WBA titleholder Jarrett Hurd or Tony Harrison, the latter of whom dethroned Jermell Charlo as WBC champion by unanimous decision last month. Hurd, Harrison and Charlo are advised by Al Haymon and aligned with Haymon Boxing’s Premier Boxing Champions, which has three- and four-year deals with the Showtime and FOX networks. Munguia also addressed being dismissed by the other division champions.